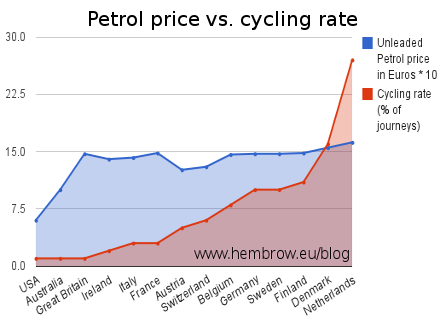 Note that even though this is almost flat between Great Britain and the Netherlands, this is the best case graph for people who think there's a correlation between car fuel price and cycling. This is because this graph concerns only the price of petrol. If you compare diesel prices then it doesn, those are somewhat lower in the Netherlands vs. other countries. Diesel costs less here than in the UK, for instance and perhaps unsurprisingly, diesel cars are common in the Netherlands. One of those myths that won't die is that the Netherlands has a high rate of cycling because the price of petrol ("gas" to Americans, "benzine" in The Netherlands) is high. This seems particularly to be suggested by Americans, because the price of petrol in their country is so low, and so is the cycling rate. However, I don't believe this to be the case. If you remove the USA, and Australia to a lesser extent, many other countries have very similar petrol prices, but markedly different rates of cycling. The graph shows the rate of cycling as a percentage of journeys in several countries in the world, plotted along with the January 2011 prices for petrol. There are three areas of this graph which show a story. On the left you can consider the USA, Australia and Great Britain. All three of these countries have a cycling rate of around 1%, but the petrol prices are spread widely - between 60 cents and €1.47 per litre. You can then consider the largest part of the graph, Great Britain through to Finland. In all of these countries except Austria and Switzerland, the petrol price is very similar: between €1.40 and €1.48 per litre. However, the cycling rates vary across nearly the whole spectrum, 1% of journeys at the low end and 11% of journeys at the high end. The two end positions are taken by Great Britain with petrol at €1.47 per litre and Finland where petrol costs €1.48 per litre. Lastly, take a look at the top three: Finland, Denmark and the Netherlands. If you look hard enough here, then you can see an upward trend in both petrol price and cycling rate. However, petrol in the Netherlands is actually only 11% more expensive than Finland (€1.62 vs. €1.48) while the cycling rate is 2.5 times as high (27% vs. 11% of journeys). But what about diesel ? But actually, this doesn't tell the whole story. Because we've considered only petrol and not diesel, we've simplified the issue. When I last covered this, I noted that while petrol was more expensive in the Netherlands than in the UK, diesel was 14% cheaper in the Netherlands than in the UK. Considering both petrol and diesel together, the price of fuel is actually more equal between nations than it appears on my graph. For the driver of a diesel engined car (roughly half of new cars sold in Europe run on diesel), the fuel to run it is actually cheaper in the Netherlands than in Britain - yet these two countries span the widest range possible of cycling rates. I think it's fair to say that there's no real relationship shown here between the price of fuel for cars and the cycling rate. Even when fuel for cars is expensive and congestion results in journeys being slow and inconvenient, people will continue to want to drive if driving remains the least bad option. The cost of taxation and insurance are also not factors which make driving more expensive in the Netherlands. Insurance for new drivers in particular is much cheaper in the Netherlands than in the UK. Many myths and excuses exist for why the cycling rate in other countries is lower. The only thing which really explains why the Netherlands stands out so far above other countries is that the experience of cycling is so different. In the Netherlands, cycling takes place away from the threat of motor vehicles on good quality cycle paths and roads which prioritize cyclists. Never is it necessary to take on busy motorized traffic by bike, or even to ride up the side of rows of stationery vehicles. This leads to an outstanding level of subjective safety, and as a result all types of people cycle. To see the policies, infrastructure and campaigning which have lead to the Netherlands having both the world's highest cycling rate and also the world's safest cyclists, click on what works. Cycling rates for the graph are taken from here and here. Prices for petrol (current in January 2011) come from here, here and here. I covered the same excuse previously. However, it keeps coming up again, so I think it's worth repeating. A few days ago, Kever53 subscribed to my youtube channel. I had a look at his videos and found this great one which shows off Houten. You'll see all types of people cycling, including the sporty, Mums with children, children on their own. Young, middle-aged, and elderly. It's like a microcosm of the Netherlands as a whole. Everything's connected by cycle paths, housing, shops, schools, railway station, beach, and at the end you see how the old village centre is also connected. Houten is a town of 38000 people in the Netherlands. It's an ancient city, but in 1966 was designated as an area of growth and started expanding rapidly. Houten is known world-wide as a town which was designed to prioritize cycling. The result has been a high rate of cycling and a very low rate of injuries on the roads and cycle paths. Many things which were tried out first in Houten have spread across the country. However, Houten's achievement is still significant. Three years ago, Houten won the title of "Fietsstad 2008". I've blogged about Houten before. You can find these posts here. "The busiest cycle street in the world" ? Why do we keep hearing exaggerations about Norrebrogade / Queen Louise's Bridge in Copenhagen? An industry seems to have grown up around promoting Copenhagen as the world's top cycling city. Sadly, some of the claims made do not stand up to much scrutiny. For instance, Nørrebrogade is claimed to be "the busiest cycle street in the world". It's certainly the busiest cycle street in Copenhagen. Being 3 km long and taking a straight line path right through the city, it and the bridge on it are a funnel for cycle-traffic which uses this as one of the most direct routes to several locations. Very many of the photos of cyclists from Copenhagen are shot on this road because it's the busiest. of bicycles here do not stand up to scrutiny. A recent widely reproduced press-release from the city claimed that 36000 cyclists use the road every day. Some websites go further and claim 38000 per day. Usually you have to assume that such printed figures are correct, and that's what I did too. However, in this case someone pointed to me that it's unusually easy to check it for yourself. This count was made on the same street as a famous public bicycle counter which many of you will already have seen photos of. The counter displays both the current date and the number of cyclists who have passed since the 1st of January, so a a simple calculation can be done by dividing one number by the other. Take the photo on the left as an example (click on it to see it in greater size at its owner's website). It shows 1559492 cyclists had passed by the 4th of June 2010, which was the 155th day of the year. That's just 10060 cyclists per day on average by half way through 2010. It is a respectable figure, but not close to the claims so often put forward for the street. So what's going on here ? I don't know. It's surely good marketing to have "the busiest", but don't we need a bit more than that ? Before Christmas I emailed the two people who were responsible for a document about the street to find out where the numbers came from, but have not had an answer (see below). Counters in many different places in the Netherlands record higher numbers than this. For instance, eight locations in Utrecht have more than 10000 cyclists per day, and one of them has more than 22000 cyclists per day. In Groningen, six different places have counts greater than 10000 per day, two of those are above 14000 per day. Bear in mind that Copenhagen's population is more than three times that of Utrecht and six times that of Groningen. Counters in larger Dutch cities almost certainly record higher figures. Danish professionals, including the Cycling Embassy of Denmark give a slightly different perspective. This is the inside back cover of one of their recent publications, giving some numbers. The Danes now cycle for 16% of their journeys. Sadly, this is lower than the 18 or 19% measured just a few years ago and which I have quoted in the past. The difference is significant. It's equivalent to one in eight cyclists giving up. This is not something to celebrate - it's terrible news. We need to know the cause of the decline and work out what can be done about it. Some of the other figures are also interesting. 36% of Danish adults ride a bike to work "at least once per week". The percentage of daily commutes is not given, but it will of course be lower. 45% of Danish children "often" bike to school. Clearly this isn't the percentage who cycle every day, which again is not given and will be lower. "Often" is open to interpretation but could be less frequent than once per week. This is a startlingly lower rate of school cycling than is seen in the Netherlands, and that's important. Cycling has to start with children. Note also the claim that 2/3rds of children under 11 use helmets when cycling in Denmark. This is not something which would be highlighted if it wasn't thought to be important. However, it is again very different from the Netherlands, where despite occasional ill-judged campaigns, helmets are still only rarely seen except on sport cyclists. It's another sign of cycling under pressure. People are scared for the safety of their children, and perhaps this has some connection with the reduced rate of cycling. Lastly, note that 2.2 metres is the new standard width of cycle lanes in Denmark. That's somewhat narrower than the 2.5 metres which is standard here for single directional cycle paths, and it's again a thing which puts cyclists under a little bit more pressure. It all adds up to a bit of a murky picture, similar to what I pointed out before. Copenhagen, and in the wider sense, Denmark, has a relative lack of subjective safety and this is stifling bicycle use, even in the top city of the world's second cycling country. Helmet promotion campaigns like this are only likely to contribute to the decline in Denmark. I'm not happy about any of this. 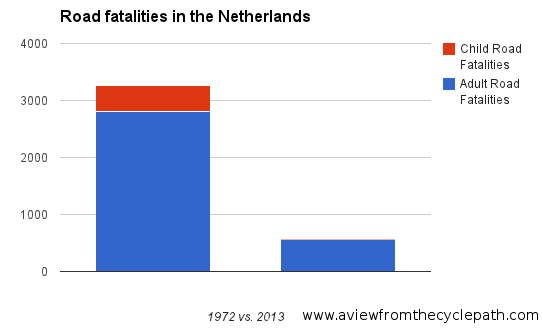 Cycling is extremely fragile, even in the two great cycling nations of the Netherlands and Denmark. It doesn't take much to stop people from cycling. 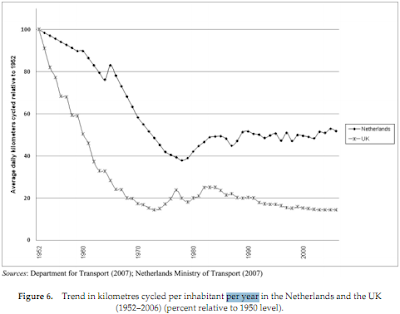 If care is not taken, cycling in the Netherlands could also decline. We need ever better standards for cycle provision and no negative marketing. 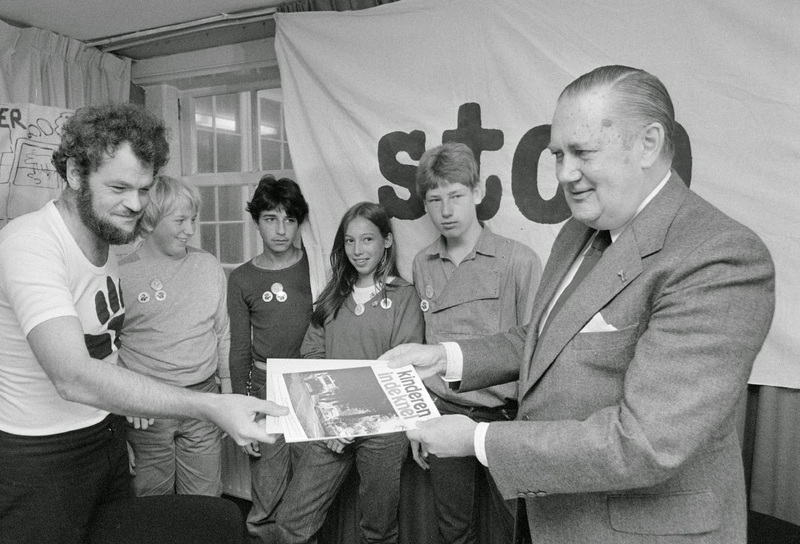 We all need to be able to learn from what has caused the decline in Denmark. It's clear that Danish cycling policies are not succeeding as we all wish they would. This problem of declining cycling has not occurred in the Netherlands, and that is as good a reason as any why The Netherlands remains the best place in the world to turn to if you want to see what successful policies look like. 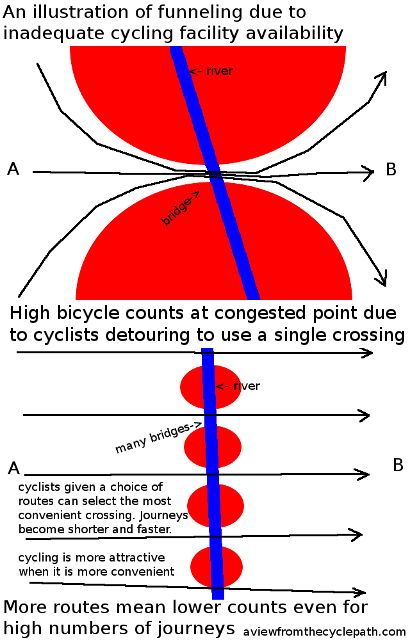 The survey that resulted in the number of 37.000 cyclists on Norrebrogade on the bridge where the counter is placed was conducted manually in early September 2009. We know that early September is a peak period for cyclists with good weather and due to the start of the academic year for the universities in the city. The number of 37.000 cyclists represents the average number of daily cyclist on a normal work day in both directions on the street during the peak season. As an average in both directions on a normal working day throughout the year, the daily total number of cyclists on the street is around 28.000. The counter relies on a sensor placed below the asphalt on the bicycle path only. We know that during the rush hour some faster cyclists overtake slower cyclists using the road, and some even the walkway. We find that the counter does not register all cyclists when the bicycle traffic is dense. It is our experience that the automatic counter generally counts around 10% less cyclists than the actual number during the peak hours and around 5% less in normal hours. The idea of the counter is not to be an official measurement, but more to give the cyclists an idea of the approximate magnitude of bicycle traffic on the street as they pass by and a feeling that each individual cyclist contributes to make Copenhagen a City of Cyclists. The numbers counted by the automatic counter cannot be relied upon for academic purposes. However there is no doubt that there has been an increase of around 7000 cyclist daily on the street of Norrebrogade as a consequence of the project there, since the manual surveys of bicycle traffic before and after the project were made using the same method and the traffic was counted at same time of the year in the surveys before and after the project was initiated. Thanks to Klaus and Soren we now know that the widely reported "average" picked up by the marketing people and the media was actually a peak, and we also know the official average for a working day over the year, including a compensation for the cyclists missed by the automated count (other places could perhaps use the same compensation), but still not the average for all 365 days of the year. I'm of course very pleased to see that the improvement in conditions for cyclists on this street resulted in an increase in cycle traffic in this location. 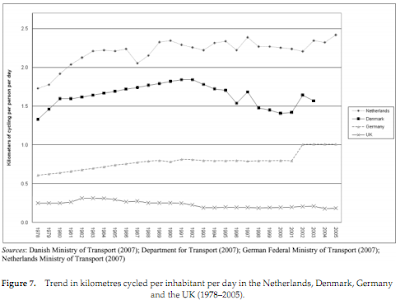 However, it has to be viewed alongside the unfortunate decline in cycling overall in Denmark. See previous articles about Copenhagen. There are also previous articles about helmets, and particularly amongst them, this one which points out that the "danger" of cycling really has been blown out of all proportion next to that of driving. Others have pointed out that a lack of sufficient investment could be behind the lower cycling share in Copenhagen vs. Dutch cities. This year, some people I know from Cambridge visited Copenhagen and wrote about their experiences. They also took some photos, including the one on the right, which while it's supposed to be representative of a street along which "up to 35,000 cycle trips per day" are made, actually shows that something unpleasant has happened on the "busiest cycle street in the world". The photo shows the state of the sign on the 27th of May 2012. By that date, the 148th day of the year, 1261731 cyclists had passed the sign. In other words, in the first five months of 2012, the number of cyclists riding past this point averaged 8525 per day. This number is not only a long way short of 35000, but compared with the numbers which I used to make the calculation at the top of this blog post, it's evidence of a 15% decline in cycling in Copenhagen compared with a count from two years previously. Both counts were made by the same permanently installed counter in the same place and both over the first five months of the year. This 15% difference cannot be explained away as an artifact caused by just a few days of bad weather - it's equivalent to 22 days of cycling being lost in just half of one year. A 15% decline over two years in the busiest street in the city sounds catastrophic. Why has this happened ? Why did Copenhagen choose to hype the cycling rate on this street if it were actually in decline, and why do they continue to hype the amount of cycling in this street in the light of such a decline ? A 15% drop is in line with an acknowledgement by the Cycling Embassy of Denmark last year that cycling had dropped from between 18 and 19% to 16% of journeys within Denmark, but they were referring to a different decline which had happened over a much longer period than two years. All trips within Copenhagen 2002.
fifth", cars just over half. In 2002, "slightly less than one fifth" of journeys within the city were by bike. A target was set in the same year to increase commutes only to 40% by the year 2012. This target was missed. 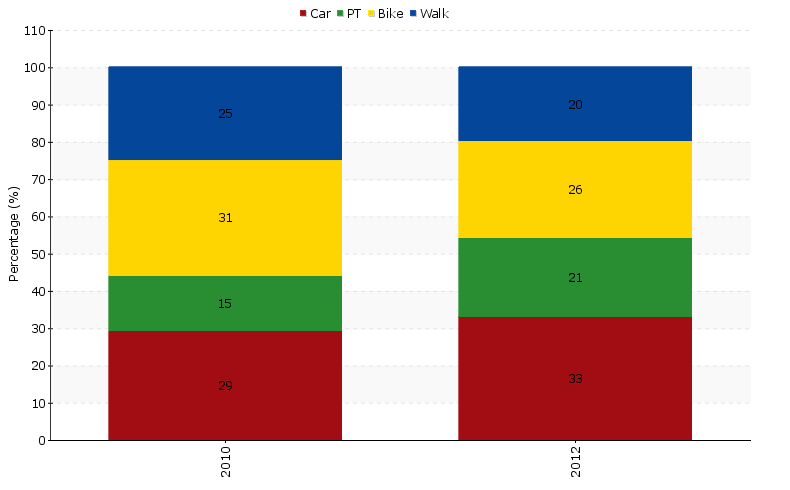 There was some reported growth in that official figures show that commuting by bike rose from 32% in 2002 to 35% in 2010, but instead of acknowledging that the 40% target for 2012 wasn't going to be achieved, Copenhagen instead announced a 50% target for 2015. It would take an extraordinary and unprecedented growth in just a few years to achieve this. The 50% target sounds great of course, and that is what is supposed to do. It's an artifact of marketing for Copenhagen, not of the real cycling modal share. At best it's only a target, and it's a target not for all journeys but only for commuters. No-one should reproduce this figure as an achieved modal share, because it has never been any such thing. In 2009 when I estimated that Copenhagen's true bicycle modal share was around 22%, the head of Copenhagen's bicycle programme wrote a supportive comment on this blog. If the same rate of growth has been continued for the last three years then we would expect that the true modal share for Copenhagen in 2012 is around 23-24%. However, this is rather difficult to determine because the numbers are no longer easy to find. All trips within Copenhagen 2010.
transport. They missed out walking. While the figures for 2002 (in this document) were truly for all modes, the figures issued for 2010 which appear to show dramatic growth do so in large part because they have omitted to mention the approximately one fifth of all journeys within the city which are made by walking. Assuming that around a fifth of journeys still being by foot, the diagram on the right would indicate that approximately 26% of journeys are now by bike in Copenhagen, which is more in line with my estimate. However, note that these figures are for trips "starting or terminating in" the city and we don't know how this phrase is defined nor how the figures were calculated. We have to be wary of tricks, especially when we're looking at figures from a place with a history of exaggeration. People from other countries looking for inspiration are often drawn to Copenhagen because of the deluge of publicity from the city. However, they need to look further than headline figures ("half of their urban trips" etc.) which form part of a marketing effort from Denmark. There was a time when the annual bicycle reports and policy documents from Copenhagen were the envy of the world, and a time when they presented good data which could be compared one year with the next. However, these official documents are no longer what they once were. The Danish people deserve much better than this. Selling the "cycling city" of Copenhagen as a brand does not help people to cycle in the city. 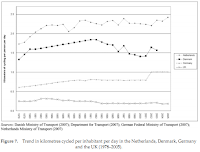 From the evidence that is available it appears that cycling is dropping and not rising, both in Denmark as a whole and on some main streets of Copenhagen if not across the whole city. Less hype, more substance and maybe even a little humility is required before Copenhagen can achieve its potential. More investment is needed to give the city any chance at all of meeting the old target, let alone the new one. The environment needs to be transformed to be truly safe for cycling. Bad infrastructure designs need to be abandoned and no longer presented to the world as something to copy. In particular, the "Copenhagen left turn" is not, and never was, a good design. Drivers turning right should not be encouraged to merge with cyclists as they approach traffic lights. Advanced stop lines (aka "bike boxes") are not advanced cycling infrastructure - they create conflict which should be avoided and they should not be promoted. Unfortunately these ideas are still being presented to the world as something to emulate. These days, it is not only Copenhagen which is doing this. Earlier this year, Amsterdam also presented numbers which excluded pedestrians to make the figures sound better (I wrote about that too). In the last few days I read an impressive claim from someone in Utrecht about a claimed commute only cycling modal share for people who both live and work within the city of around 60% (though the actual cycling modal share for all journeys within the city is apparently around 26%). Many cities across the world publicize commute only figures. This includes Cambridge in the UK and Portland in the USA. Neither of these cities gets remotely close to the modal share for cycling which is normal in the Netherlands, nor to the wide demographic of cyclists which is not only a curiosity of Dutch cycling but necessary for any place to achieve a high modal share. Cambridge's campaigners were left wondering how it was that a city where infrastructure "does not seem to be of the same elevated standard found in Assen" should have achieved the high modal share which Copenhagen claims. The answer unfortunately is very simple: they haven't. Rather, they are telling impressive sounding stories which are not necessarily based in fact. Wherever it is done, playing with statistics in this way harms us all. Without reliable figures, how can any comparison be made between countries or even within the same city on different years ? If facts are obscured by smoke and mirrors, made up figures are shouted from the rooftops, half the audience is distracted by photos of pretty girls on bikes, and a good many people are simply more interested in a nice sounding story than whether what they are being told is factual, then how can anyone tell what works from what does not work. Extraordinary claims need to be looked into and challenged, wherever they come from. Exaggeration needs to stop. A Danish newspaper reports that cycling in Copenhagen has "stagnated" and that the 50% target for 2015 can't possibly be met. The only way to a higher cycling modal share is to build better infrastructure. We are still willing to help Copenhagen to "Groningenize" itself. Earlier this year I read reports of how Copenhagen and Denmark in general had learnt from their decline and were changing course. I wrote about this change of direction because of it being extremely good news for Danish cyclists. It is only by recognizing a problem that it can be fixed and it appeared that the Danes had learnt their lesson and were going to fix their problems. Unfortunately, only a few short weeks after that happened, Copenhagen started fresh claims of having "the busiest cycle street in the world". This time they claim to have over 40000 cyclists per day travelling over the bridge. I'm not going to link to a source because frankly this sort of hype does not deserve any encouragement at all. Copenhageners: Please stop exaggerating your achievements. This is particularly unhelpful when independent figures show a decline between 2010 and 2012. In any case, a high number of cycles in one spot is not actually a sign of success. It's not something to celebrate. The funneling effect indicates that there are a lack of routes and may actually put people off from cycling. When similar things happen in the Netherlands, there are other routes which cyclists can be encouraged to use. This is possible because of the high quality grid of cycling infrastructure which covers the whole country. The importance of this has been understood since the 1980s and this is perhaps the most important lesson from the Netherlands yet to be learnt elsewhere. International marketing of Copenhagen needs to take second place to actually solving the problems facing cyclists in Denmark. traffic jams for bikes! Read more about funneling. The hype over this location and of Copenhagen in general, continues. Five and a half years have passed since I debunked the claim that 37000 cyclists per day ride over the Dronning Louises Bro in Copenhagen and in all that time, no-one has been able to provide a justification for that claim. Rather than attempting to justify the previous claim, the same players have moved on to claim a rise to 42000 cyclists per day passing over the same bridge. Exaggeration doesn't help Copenhagen's cyclists and it doesn't help anyone else either. What is happening is that the facts are being obscured. What's more, even if the claims were true, they're not necessarily something to be proud of. Thousands of cyclists forced into a detour to take the same route because there are relatively few options available to cross a river may make for nice photographs and good headlines, but it does not make for efficient cycling. Funneling is bad for cycling. It's better that cyclists can choose from a finely spaced grid of high quality routes which enable each person to choose a relatively lightly trafficked and more direct route to their destination. That, though, is of less use if your primary goal is to market your city internationally by use of impressive looking photos and ever more exaggerated figures. No-one celebrates traffic jams for cars. They shouldn't celebrate traffic jams for bikes either. Big queues of bicycles are a sign of failure. A comprehensive cycling grid allows more efficient journeys to be made. I learnt two things this evening. Firstly, funding for cycling in the UK has been cut. This blog post revealed this little piece of information hidden in a 99 page document full of hot-air about what the government claims to be doing for cyclists. In the past, government funding for cycling in Britain has struggled to get past the 1 pound per person per year level. i.e. 60 million for the whole population. It's now been cut to around 13 million. That's around 20 pence per person per year. It's enough to do... precisely nothing. In a city of 100000 people, it's 20000 pounds. That's not even enough to employ someone to think about doing something. Cycling Officers at councils in Britain (in my experience hard working, good people who tend to find themselves as lone voices in a council which isn't actually very interested) must be worried about their jobs right now. It's a real shame. By way of contrast, cycling in the Netherlands is funded at a rate of around 30 euros per person per year, which is about 150 times as much. That's what it costs to do a good job, and actually Britain could afford it as well. Secondly, I heard from a correspondent that it is possible that cycling will be banned at a university in Canada because they've pedestrianized roads and now the pedestrians are frightened by the cyclists. They're looking at ways to "slow cyclists down", which is of course precisely the opposite of what you need to do to make cycling into a more attractive option. If you can't get students to cycle, then who will ? They're absolutely the easiest demographic of all to attract to cycling: young adults, well educated, fearless and with not too much spare cash. All the "top cycling cities" in every country are university cities. That goes for Groningen, Copenhagen, Cambridge (UK), Davis (CA). If cyclists are banned, you convert cyclists into drivers. Both countries have fundamentally the same problems. Neither wants to treat cycling as a serious means of transport and neither wants to spend an adequate amount of money on cycling. Click through for some examples of what actually helps to bring about a cycling culture. In the past, more was written about the experience of being a cycling officer in the UK. And this is not the first time that cycling policy has been abandoned in the UK. 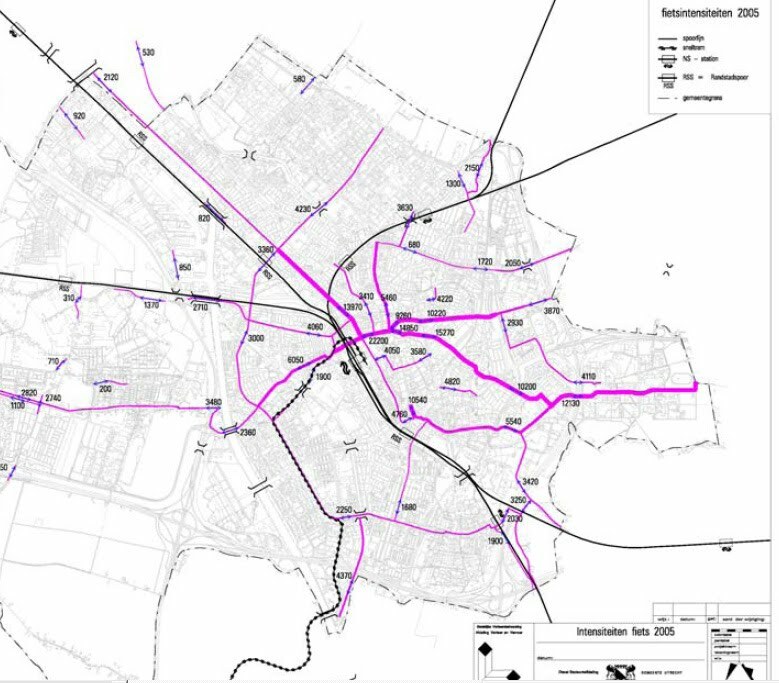 A new video from Mark Wagenbuur shows the average number of cyclists per day on some of the busier cycle routes in Utrecht. Mark says: The number of cyclists is counted regularly in Utrecht (Netherlands). The city council monitors the bicycle volume to see if cycling policies and infrastructure are still adequate. Like everywhere else that counts cyclists, these counters are subject to some margin of error. For example, cyclists who cross at the same time may not all be counted. The diagonal placing of the tubes is an attempt to make them work better with people cycling side by side. There are many more posts about Utrecht. After last week's service, today I got around to finishing the job. There is a universal joint in the steering column. It's made with a plastic block which provides a low friction and low weight method building a universal joint, but it's a part which wears over time and introduces a bit of play. In my Mango there was now a bit too much play, so it was time to replace this part. It's very easy to do. You just take out the two bolts which hold it in place, remove one block and put the other in its place. However, I thought I'd take a few photos to show what happens to the block. The photos show the old and new blocks next to each other. By the time I took mine out, the play was really a bit much. I should have done this a while ago. However, you can see that there was no danger of the steering column actually coming off. I don't think it's possible for it to get to that stage. The play comes not because the holes in the block wear larger, but due to the sides wearing down so that they are no longer flat. They rub against the aluminium of the steering column, which is harder than this plastic block, so it is just the replaceable block which wears out. I also went on the huneliggers ride this morning. Peter and Harry were waiting at the start point and the three of us set off together in our Mangos through the Drents countryside. This particular path is new and it was the first time we'd ridden along it. Lovely smooth concrete for cycling through a very pretty area of countryside. It'll be a part of this year's cycling holiday routes. One of the recreational paths that we used was a bit soft. It's got an environmentally sensitive surface, which is fair enough for what it is and where it is - through a large heath area. Normally this surface works well enough. However, after a lot of rain and a few freeze and thaw cycles it was so soft that our tyres sank into it a bit and made it rather nasty to ride on. A couple of km of this reduced our average speeds somewhat, but this is a touring ride, not a race, and the scenery is lovely here. Peter got a puncture in his rear tyre, which gives an opportunity to write about repairing punctures on a Mango. Happily it doesn't take long to sort this problem out. You just find somewhere soft that you can roll the Mango on its side without damage, and take off the tyre and inner tube. This can be done without having to take the wheel out, as all three wheels on a Mango are mounted on one side only, whichever gearing option you have. Note also that the chain cannot be seen. It's safely within the bike, and stays clean. Because of this, you don't get oily hands when doing this job, either. I'd done the same with mine before leaving home. As you can see, there's no snow and ice today, so I'd swapped back to my extremely puncture proof Schwalbe Marathon Plus rear tyre. I like these in wet conditions because I've never ever had a puncture with them. In the Netherlands, the main cause of punctures seems to be this sort of small and sharp stone. Peter has a Schwalbe Marathon Racer on his rear wheel. It's relatively puncture resistant for a fast tyre, but it wasn't quite enough against this particular stone. I like Marathon Racers, but for me they're a summer tyre. 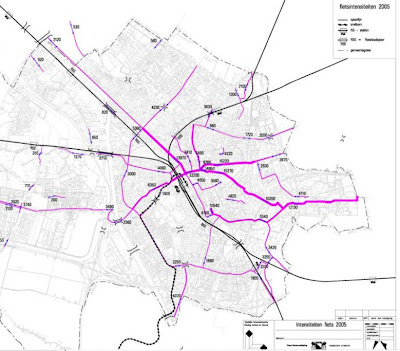 A little while ago I wrote about how the cycling rate in Assen had reached 41% of journeys. Today I was asked by another blogger if I had some other figures to go with this, and found that the link in the old article no longer worked. While looking for the original web-page on the Assen local government website, I found a different article, the "Sustainability Vision" document. This document, dating from July 2009, gives a picture of how the local area is performing on environmental and sustainability issues, and how it will attempt to improve its performance between 2010 and 2015. At the bottom of page 15 there is a discussion about how energy must be saved with public lighting. Assen has been installing LED street lights on roads and on cycle paths. There is discussion here about trying out dynamic lighting in Assen as well on cycle paths and smaller roads. This saves energy by turning the lights to full only when they are needed. On page 18 there is a section about sustainable transport. Here we find out that "The central ambition with regard to mobility is that transport in Assen is by bike". 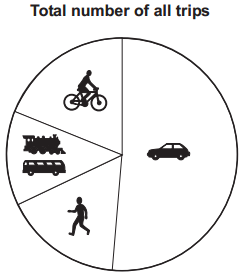 There are figures about the present day: "At present, in Noord Nederland (the three provinces of Drenthe, Friesland and Groningen combined), 50% of all journeys are by car, 3% by public transport, 30% by bike and the remainder (17%) are by foot". It goes on to explain that "around 40% of journeys in Assen are by bike" and "Assen promotes growth of cycle traffic at the expense of car traffic". The next page is headed "Assen Fietsstad" - "Assen Cycle City". Here, the introduction says that "for journeys within the city, journey times by bike must be competitive with journey times by car." I've noted before that this is usually the case. You see fewer traffic lights if you travel by bike than by car, and where there are still traffic lights, these are designed to make cycling as convenient as possible. For instance, you can turn right on red. Some of them default to green for bikes. Under "Ambition", it says "The bike is the most used means of transport for residents of Assen. In the past, development always emphasized the convenience of the motorist. New developments are designed starting with the bike. The realisation of a safe cycle route network of good quality, improvements in the attractiveness of use of bikes and improvements in directness, safety and comfort are central. By 2015, so many journeys as possible must be by bike. Bikes must more frequently take priority over cars." The bike can compete with the car if it flows freely. Traffic lights must be set up to give the bike higher priority than the car. Where possible, roads which currently emphasize the car must be changed to emphasize bikes and tolerate cars. Dangers for cyclists must be removed. Bike signage must be improved. Better cycle parking is needed. More secure cycle parks are needed. In order for these to be favourable for cycle use, they must be free of charge. The city grants subsidies for cycle parking at businesses and schools. The city encourages the use of fiscal schemes to encourage cycling. Drenthe is a province with much recreational cycling. Access to the area for recreational cyclists from within the area is as important as for those from outside the area. For recreational cyclists, a touring route around Assen will be created. More connections are needed which get past existing obstructions such as the A28 (motorway), Canal and railway line. Assen has featured many other times on this blog. And this is indeed a wonderful area for recreational cycling. Many examples of how cyclists are prioritized have already featured on this blog. Assen provides an example in this blog post, but it's not alone. Other Dutch cities are also working hard in much the same way. It's quite competitive. The photo at the top shows a view of part of the centre of the city on a Saturday. There are a lot of racks in the city centre, but they were already full and not one of these bikes is in a rack. 400 more cycle parking spaces are promised in this area. It may well not be enough. If the link in this article fails, it's also now at webcite (thanks, Daniel). The Mango has a fully enclosed drive-chain. This is a very important feature for a velomobile. Because abrasive dirt stays on the outside of the body, maintenance is very low compared with most bicycles. All that's needed for a long life with little hassle is that you regularly oil the chain (a few drops every 500 km) and wipe off any excess. You also need to put a couple of drops of oil into the top of the suspension struts. Some people have ridden as much as 40000 km on their first chain by taking care like this. I was a bit more lax with the regular oiling and just managed 12000 km. However, this is still a very good chain life. Chains exposed to the elements will often last only a quarter so long. Testing with a chain wear checking tool (new chain above, old chain below) it was apparent that my main chain had "stretched" a little beyond the point where I should already have replaced it. To say a chain has "stretched" is a little misleading. The metal does not stretch. What actually happens is that abrasive dust gets inside the bearings in the chain links themselves, wearing it out from the inside. The result is that chain no longer fits the chainrings correctly and it starts to wear them out. Also efficiency is lost. However, all this happens later and to a lesser extent if your drive-chain stays clean. I replaced the existing KMC chain with brand new SRAM 9 speed chain. I had a brand new cassette ready to replace the old one. I took apart the old cassette and looked at each sprocket individually. The photo shows the most worn tooth of the most worn sprocket on top of its new replacement. This tooth is where the sprocket is narrowed in order to make shifting easier, but which also means that this tooth wears out quicker than most. However, there is almost no wear at all. That's really very impressive. It helps a lot that the cassette is mounted inside the body, away from any dirt. The front chainrings were also not worn. 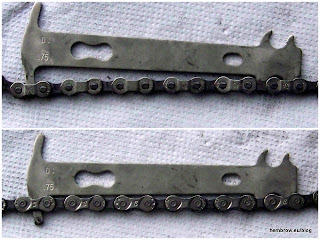 The second chain in the Mango uses 3/32" chain, but an 8 speed chain will do in this locations, so I used a PC-830. This chain was really only half worn, but I replaced it anyway. As you can see, the teeth on this sprockets for the rear chain barely have any wear at all. Even most of the paint remains on the sprocket on the intermediate drive. The idler wheel under the seat looked a bit rough. The plastic from which it was made has actually distorted. That curvature is real, not just an artifact of the photo. Perhaps this was due to the effect of oil on the plastic. However, I'm not complaining. This was a prototype idler from Alligt, made of softer plastic than the production versions. The teeth on the wheel inside folded over quite soon, and the wheel itself had actually started to deform quite quickly. I rode with it for a whole year because I wanted to see how long it would last. While it looked bad, it didn't fail. Actually, it still works just fine except that the deformation has got bad enough that it now rubs against the bracket which it was mounted on. The replacement is the new design of idler from Alligt. There's now quite a bit of play in my steering so I also need a new plastic block for the universal joint. That will come from the Ligfietsgarage next week. To check your transmission you need just the chain wear checking tool. To replace it you need chains and other parts available here. For a main chain of the Mango you need about 2.5 normal chains (buy 3 the first time you do the job, and you may need just 2 the second time) and for the secondary chain you need just one. I'm looking forward to more adventures over the next 12000 km, but shouldn't have to do much maintenance. It's a great film. I find it interesting to see that once-upon-a-time, British Rail bent over itself to make taking bicycles on trains easy even occasionally for large groups - this film was made by an organisation which existed specifically to make films like this. Britain was a very different place when this film was made. It was normal to cycle. When that film was shot, in 1955, British people still each cycled an average of over 350 km per year, a figure very similar to modern day Germany, and about a third of that now in the Netherlands. This was a time when people travelled in total a lot less than they do now so these are significant figures. British people made these bicycle journeys over the very same landscape as where many people now make excuses about hills and the weather to explain the current low cycling rate in the UK: Many British people don't realise that even within their own lifetime, before motoring took over from everything else, it was quite normal for all sorts of people to ride bikes for everyday journeys. Of course, the group in the film aren't entirely average. They're cycle-tourists, and have relatively fancy bikes. You can see that from the dropped handlebars (British touring bikes traditionally have dropped handlebars, usually set a little higher than most racers would have them) and from the derailleur gears which many of them have. 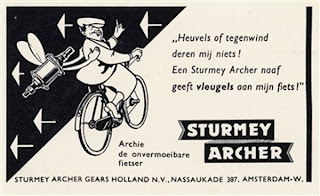 A Sturmey Archer hub gives wings to my bike. The film was made a time of transition, when tourists started to use derailleurs instead of the same three speed Sturmey Archer hub gears as normal everyday bikes had. Yes, those hills were once ridden on bikes with three gears, and little was made of it. In fact, contemporary advertisements tended to stress how easy it was to climb a hill with the luxury of three gears. The change in British attitudes regarding cycling took place over many years. Rather like the proverbial frog in a pan of boiling water, many people didn't notice what was taking place around them. Drivers in Britain, who have had the infrastructure of the entire country altered to suit them, now quite commonly believe that they are the victims of a "war on the motorist". Indeed, the government has just taken more steps to placate them. Meanwhile, many British cycle campaigners have continued to campaign for the same thing as they always have. i.e. the "right to ride on the road", even though those roads have become a far more hostile place for cyclists than they used to be, and decades of campaigning on these same issues have not resulted in any progress. The reason is quite simple: the over-abundance of motor vehicles makes British roads an unpleasant place to be on a bike. This is now the main reason why people don't cycle. It makes me very happy to see that there is at last a move in the UK now towards campaigning for the same sort of infrastructural change as prevented the Netherlands from suffering from the same fate as befell the UK. You can find examples of this here, here and here. It took time for the decline to occur, and it will take for cycling to grow back. However, there is enormous pent-up demand, as can be seen anywhere that something attractive to ride on exists. A change in attitudes can come, but only due to a real change in how it feels to cycle. Go back and look at the people in that film again. There are no reflective vests and no helmets. In 1955 people felt safe on a bike on Britain. Remember what I said about pit canaries a while back ? The chart appeared in a previous post, but I think it worth repeating in a different context. Another small point: Have you ever seen such a large group on a CTC ride ? Touring cycling thrives when more people cycle. All types of touring are popular over here. A group of us went out for a huneliggers ride today, as usual on Sunday mornings. It was a bit warmer than two weeks ago, just hovering above freezing point for most of the day. Wonderful weather for a morning ride in the Mango. Last week it was quite cold. -8 C when I rode to work on Thursday morning, for instance. However, by New Year's Eve it had warmed up a lot and much of the ice was melted. As a result, we could enjoy the fireworks without getting frozen. Today started with a very light sprinkling of snow. This meant I could tell in advance that Peter was taking part in the ride, as I followed the three tracks in the snow left by his Mango's wheels between Assen and the starting point. There were four of us humans today, Anton (who lead the ride), Georg, Peter and myself. Georg brought along his world famous "velodog", Russell. As usual, we rode through the countryside along cycle paths and minor roads. We were again lucky with the weather - everything looked wonderful. We had some very light snow fall on us for a bit, but it was nothing troublesome. Our lunch stop was by a lake in the forest. It's not really a touristy spot. In fact, it's really a quarry where sand is extracted (hence the "no entry past this point" sign and the pipes. However, it was completely quiet today and it looked really beautiful. I'd not got around to making sandwiches for lunch. However, I had something else: Kendal Mint Cake which my Mum gave me for Christmas. It's perhaps not normally the healthiest thing to eat, with the proud boast on the packet of "350kcal per 100g", however even though we weren't putting in quite so much effort as the British Everest expedition of 1975, it was very enjoyable. I rode through Kendal back in 2006. We stayed at the lunch stop for quite a while, talking, admiring the view, enjoying the sun and taking photos. Most of us wrapped up to stay warm but Russell, like all dogs, seemed to enjoy rolling in the snow. Last Thursday I had a bit of a fright on the way home from work as I crashed my Mango on black ice. It had been quite cold in the morning, but had warmed up just above freezing in the day, rained a little bit, and then gone back below freezing by the time I left for home. Very dangerous conditions. Even though the gritters were out on the cycle paths and roads before I went home, there were slippery patches. I found one of these on the way home. I put the brakes on just before a junction on a minor road and my Mango span on the spot, fell over and slid to a halt on snow at the edge of the road. Luckily there was no damage to me or to the bike. When I went to look I could immediately see the cause: Where I'd brakes, there had been ice under the rear wheel and one front wheel, while the other front wheel was still on asphalt. When I got home I fitted a Marathon Winter to the rear wheel of my own Mango and went for a short test ride. In the same treacherous conditions the bike remains in a straight line, whatever is under the wheels when I brake. Much better. Today was the first proper ride with this rear tyre and I'm very happy with it. Of course, I'll change back to a non-studded tyre when the danger of ice has passed. After lunch, just as we were starting to cool down a bit, it was time to go, heading through more of the beautiful countryside. We started off heading North, towards Groningen, which was good for Anton and Georg, but not really the right direction for Peter and I, so after a bit we left the other two and turned towards home. Just under 65 km in all. Not a long ride, but a very enjoyable one. Happy New Year, everyone. I hope you've also been able to get out on your bikes, whatever weather you have.